In a pot of boiling salted water, cook the spaghetti until tender. Drain and rinse under cold water until cooled. Drain well. Peel and chop the ginger and garlic cloves. In a blender or food processor, purée the peanut butter with the ginger, garlic, vinegar, sugar, soy sauce, water, sesame oil and red pepper flakes. Heat the vegetable oil in a large skillet over medium-high heat. Cook and stir the vegetable medley until just tender. Season to taste. 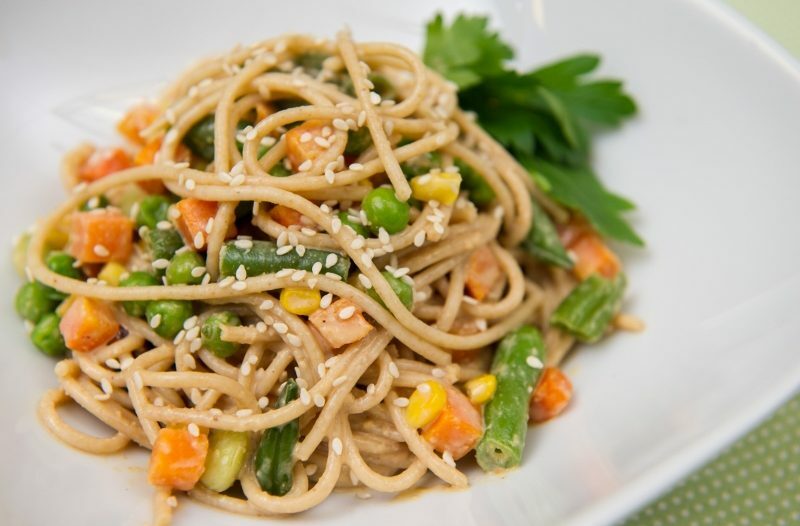 Toss the cooled spaghetti with the cooked vegetable medley and peanut sauce until well coated. Garnish with sesame seeds and serve warm, at room temperature or chilled.